Transforming the way people train, view and compete in sports, Intel CEO Brian Krzanich announced a series of exciting collaborations with leading industry brands that will use technology and data analytics to benefit people's overall health, fitness and athletic performance. 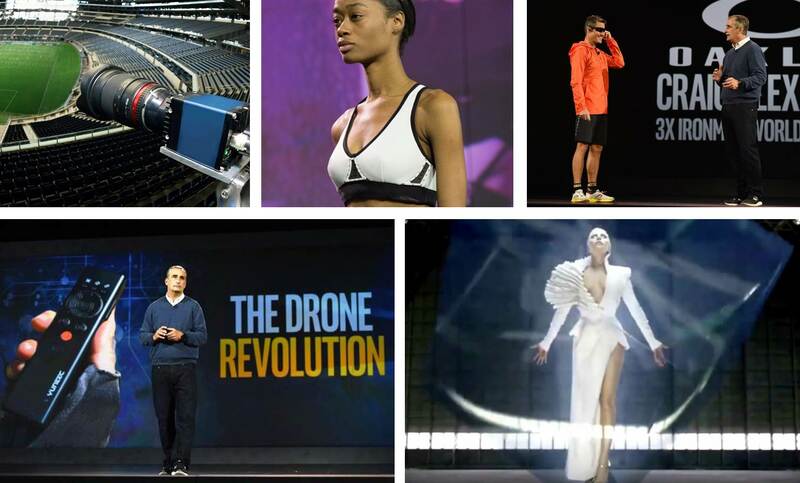 Intel announced plans to work with ESPN and Red Bull Media House to design Intel-powered solutions that empower athletes and bring amazing viewing experiences to life, and joint efforts with New Balance and Oakley to personalize and advance the tools people use to be more active. As Intel technology continues to inspire people to create, invent and explore, Krzanich announced a multiyear partnership with The Recording Academy® as part of its official "Next Generation of GRAMMY® Moments" to bring technological innovation to the program so people can see, engage and be amazed by the evolution of technology in music. The first artist to collaborate with Intel to create a unique musical experience - will be six-time GRAMMY®-winning global music icon Lady Gaga. These collaborations underscore the three trends that Krzanich said are shaping the future: the smart and connected world, technologies gaining human-like senses, and computing becoming ultra-personal. The slalom skiing champion Marcel Hirscher escaped unharmed after a drone carrying a camera fell from the sky and narrowly missed him on his way down the slope during a race in Italy. The industry is so exciting there’s a convention every other week, professional/casual publications, training/educational schools, professional organizations (like the Drone Coalition) and clubs cropping up everywhere. Timeline’s OB16 is a medium size, single expanding, OB truck that can cater for 12 cabled cameras along with multiple radio cameras. The unique feature of this OB truck is the built in 1.8 metre satellite dish and fully redundant uplink chain. This enables the truck to provide both comprehensive production facilities and uplink services reducing costs. The production area is fitted with a Snell 6400 Kahuna vision mixer with a large maverick control service. This comprehensive mixer can be configured to provide multiple MEs enabling powerful productions to be catered for. All of the UK’s networks have trusted Timeline to deliver technical and creative facilities for programmes as diverse as live music and awards shows, political conferences, global and domestic sporting competitions, light entertainment and current affairs. GDS is the best entertaining TV channel in Georgia, which gained a huge popularity over the last years competing with several other channels offering some great and amusing programs for everyone. The GDS stands for Georgian Dream Studio. However, in the beginning the channel GDS did not show an upward trend, but the programs referring to the urban lifestyle, comedy shows and some other musical shows did their best. According to the recent surveys, GDS is always among top five Georgian TV channels. Recently GDS took delivery of its first HD OBVan via the Lituanian system integrator TVC. The large-format location recording vehicle has been specifically designed to produce audio for the largest shows with clarity, style and reliability. The inside has been designed to make the most arduous of tasks straightforward, and has been involved with some of the most prestigious shows of the last few years. Particular care has been taken with redundant systems and power distribution. There is a 6KW UPS on board that can run the truck for 30 minutes in case of mains power interruption. Every piece of technical equipment has either dual power supplies or is fed from a source transfer switch with two independent inputs. Since 2003, Nev Production has developed into one of the largest and well-respected independent production company in Turkey. We offer outside broadcast units to customer across the Europe, not just outside broadcast services, but complete solutions encompassing the latest outside broadcast Technologies, all delivered with Professional attitude you’d expect from us. NEV offers facilities for broadcasting live events, from concerts to sports, as well as sophisticated studio productions and reality TV shows, for any major planned event NEV PRODUCTION is skilled and highly experienced in providing the production units and crew. Every day our 7 SNG-trucks transmit news and sport programmes to Danish and international TV-stations. We also produce and send communication solutions for larger companies and organisation in connection with annual meetings, conferences, presentation of annual reports or PR events. The staff at East Productions are able to solve a varied range of tasks - whether we are talking a quick one camera news flash, a fully redundant uplink from an OB truck or a complicated five camera production for satellite transmission. Recently the 20 camera OB4 was added. The two shows, ‘Carlo’s TV Café’ and ‘Voetbal Inside’ were aired in late November by the leading Dutch commercial channel RTL4. By making use of the Cloud Production Platform and IP connectivity, DutchView Infostrada is able to dramatically reduce on-location and in-studio resources, eliminating the need to commit dedicated studio suites, OB trucks and production teams to each individual project. Instead, all production operations were centralized on the company’s own data centers at the Media Park in Hilversum, fed by IP-streamed media over its own dedicated dark fiber-optic network links directly from the event, studio and centralized galleries. Open standards work for the IP transition is already underway by the 74-member Video Services Forum (VSF), with the support of organizations such as SMPTE and the EBU. AIMS endorses the work of the VSF and will continue to lend support in the development of a standard approach to IP. More than 30 broadcast equipment manufacturers are actively testing and validating the VSF’s approach today. IMS provides specific guidance in its bylaws to its members and to the media industry via the AIMS Roadmap. The organization endorses an IP transition plan that includes support for SMPTE 2022-6, AES67 and VSF recommendations TR-03 and TR-04. Since ASPEN's first release at NAB 2015, many leading broadcasters and equipment manufacturers are realizing the benefits of the ASPEN protocol for their leading edge IP facilities and products. Developed to meet the real world requirements of an IP-centric facility while leveraging proven MPEG2-TS standards, ASPEN offers a robust format for encapsulating uncompressed Ultra HD/3G/HD/SD over MPEG-2 transport streams (TS). The development of ASPEN has been a collaborative effort of Evertz and many broadcast industry leaders (24 members as of December 2015). Building the IP facility based on ASPEN gives NBC Sports greater flexibility and cost savings over an SDI replacement using SMPTE 2022-6. VPs of technology and chief engineers from leading broadcasters in eight countries were interviewed. Respondents were asked about a specific workflow within their operations to understand how this nominated workflow is used, discover what the pain points are and to gain an insight into their opinions on IP within live production. “IT equipment and software has been present within the broadcast industry for well over 15 years now, with file-based workflows used widely around the world. The last area holding out from the transition to IT based system and architectures is live production, the most precious but also most complex form of content production,” says Adam Cox, senior analyst, broadcast & professional video equipment, Futuresource. “The customisation by Presteigne enabled Vislink HEROCast™ wireless transmitters and GoPro™ cameras to be unobtrusively cycle-mounted just beneath the saddle of selected bikes, which enabled us to deliver outstanding, uninterrupted pictures and, more important, exciting viewing.” HEROCast is Vislink’s smallest, lightest COFDM wireless transmitter and is designed for use with GoPro™ cameras. Further system and mounting customisation by Presteigne enabled the on-board package to conform to the rules and standards of professional cycling, and provide high quality images while being virtually unnoticeable to the competitors. The critical connectivity provider of choice is already well established as Europe’s largest supplier of satellite uplinks, and has now added Alexandra Palace to its rapidly expanding list of fibre linked venues. SIS LIVE is providing main vision and reverse vision on fibre for Sky Sports’ coverage of the World Championship from Alexandra Palace, as well as satellite back-up allowing switching to ensure continuous service, if necessary. The World Championship were shown on Sky Sports’ dedicated darts channel, which screened all the action from 17th December to 3rd January, to millions of viewers. “The 2015 European Short Course Swimming Championship was, for the first time in its history, held in Netanya, Israel in December,” reveals Bezalel. “We were brought in to deliver a live OB, and supply 20 international EBU broadcast partners including the BBC, ORF, NOS, SVT and TVE with coverage of the five day championship.” “In order to cover every angle of the meet, both above the water, and below, we devised a 14 camera setup. That included two super slow motion camera positions, a further two underwater PTZ turn cameras, located at either end of the pool, as well as a robotic dolly system and an overhead camera. The live performance of U2 and the Eagles of Death Metal three weeks after the terrorists attacks was worthwhile the efforts. U2 frontman Bono introduced them on stage for the encore with the stirring words: “They were robbed of their stage three weeks ago — we’d like to offer them ours tonight.” Bono and Eagles singer Jesse Hughes shared a hug and then launched into Patti Smith’s Power Have the People. When Jesse took to the stage he said: "Paris, we love you and we will never give up rock and roll." U2 then retired from the stage, leaving Eagles of Death Metal to perform their own song I Love You All the Time. Bono had opened the show with the words: We're in Paris - feels like the whole world is in Paris. We are all Parisians tonight. If you believe in liberty, Paris is your home town. Earlier in 2015, mobile production specialist TNDV proudly managed the multi-camera production for two pilot episodes of Skyville Live, the Emmy nominated music series that brings musical performers together with an intimate audience. The success of those shoots led to an invitation to provide turnkey mobile production services for a special December program, streamed live exclusively on USA TODAY’s website with sponsorship support from Gannett Company, the national newspaper’s publisher. The December program, which featured performances from Gregg Allman, Little Big Town, Chris Stapleton and Taj Mahal, originated from the Skyville Live studios in the heart of Nashville. London Live has been called the metropolitan face of Ofcom’s Local TV initiative, following its launch in 2014. From its purpose built studios in Kensington, the channel produces five hours of news, arts and entertainment programing every day, which is targeted at the 4.4 million homes in Greater London. Marco Bizotto, one of the channel’s engineers, gives us a tour of the studio facilities and the bespoke Blackmagic Design workflow that was developed specifically for London Live’s varied live production requirements. No fewer than 156 Optocore devices were used to create a stable fibre backbone for signal transport when the recent COP21 (2015 Paris Climate Conference), was held at the Paris-Le Bourget Conference Centre. This ensured that audio and other data streams were delivered robustly and with minimal latency to a variety of destinations. The summit, attended by 196 nations, set out to achieve a legally binding and universal agreement on climate, with the aim of keeping global warming below 2°C.Host broadcasters, AV France, tasked with supplying live pool feeds to television and radio broadcasters and journalists, chose the Optocore solution to help create two distinct digital networks. Screened by Zhejiang Satellite TV, The Voice of China recently completed its fourth series – the most popular and most widely watched to date. Based on the same concept as NBC’s The Voice, the show features four judges/coaches who used blind auditions to identify teams of singers they wanted to work with during the series. Series Four was hosted by Hua Shao, who has been hosting the programme since its inception in 2012, while this year's coaches were Na Ying, Wang Feng, Harlem Yu and Jay Chou. Chief audio engineer for the show's 5.1 surround sound production was Mr. Lou Wei from CTPC Studio, a division of CCTV. Working on behalf of Dolby® China and the production company responsible for The Voice of China, Mr Lou has been looking after 5.1 surround sound and broadcasting since the first series. Installations across the region reflect the growing number and size of broadcast installations in the region’s Arab territories, as well as their increasingly demanding workflow requirements. Lawo’s involvement is also an indication of the continued success of the German company’s developments in TV and radio broadcast production. It also demonstrates that broadcasters in this expanding and technically demanding market are ready to adopt new approaches and future-facing technologies, and have found a strong partner in Lawo. Blackmagic Design has announced that German satellite channel pearl.tv has installed a 12G-SDI multicam workflow using Blackmagic Design broadcast infrastructure to become the first European broadcaster to transmit in 4K to ASTRA. The Ultra HD workflow features Blackmagic hardware including the ATEM 2 M/E Broadcast Studio 4K, Studio Camera 4K and Ultra Studio 4K Extreme. Based out of the EnStyle Studios in Buggingen, Germany, the shopping channel, which covers the entire German speaking world and reaches potential customers in 27 million households, has always been at the forefront of broadcast innovation. Essential to the channel’s move to Ultra HD transmission was the ability to work with 4K in higher frame rates. The First Ultra HD Video Conference in the World was Held in Turkey Across 5 Locations: “Satellite, Space and Technology Days powered by TURKSAT” hosted a new global advance in the Ultra HD 4K broadcast technology, which is regarded as the peak of broadcast technology. The ministers of Transportation, Economy, Technology and Sports participated in the event and four mega projects of Turkey met the viewers in 4K in the downlink centre at Halic Congress Centre.The broadcast was on TRT 4K and the graphics of the broadcast were prepared by the local software team Konatus. Harmonic announced that they have created Ultra HD (UHD) content in high dynamic range (HDR) with the National Aeronautics and Space Administration (NASA). The content was on display for the first time at CES 2016, Jan. 6-9 in Las Vegas. Harmonic and a broad range of ecosystem partners, including Broadcom, LG Electronics, Sigma Designs, STMicroelectronics and ViXS Systems, showcased how content was produced and delivered in HDR UHD transcends using current UHD BT 709 video format, making the television viewing experience significantly more compelling.